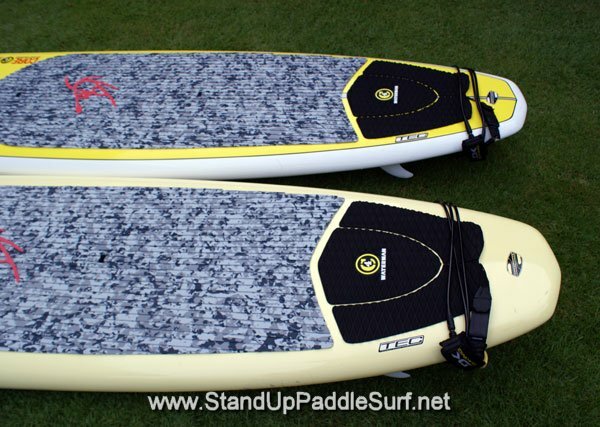 I got the sneak peek at the new C4 Waterman stand up paddle surfboards for 2008. 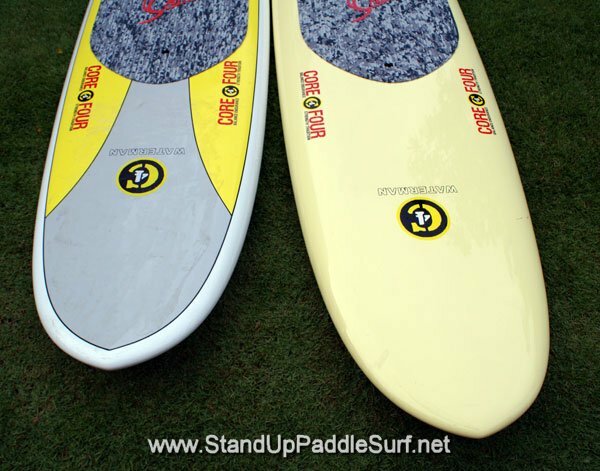 They are the 10′ x 28″ Brian Keaulana Wing Swallow Hawaii Performance Stand Up Paddle Surfboard, the 9′ x 27″ Bat Tail Hotdog Board and the 9′6″ x 27″ Swallow Hawaii Performance Fun Board. Woke up to calm(er) winds this morning and decided to catch the tail end of the S swell before hopping on a plane later today. Grabbed the 9′6″ Chambers and jumped in around 7 a.m. by publics. Paddled over to Queens and immediately knew it was gonna be fun. Only one other SUP out and a hoard of other prone bodies in the lineup. The tide was coming in pretty fast and the waves were getting a bit mushy. Perfect. Was able to paddle in smoothly from the outside, stroke into the flat section and lined myself up for the nice walled up section over the inside reef. I decided to work on hanging five today and managed a couple long noserides. It is pretty nice to have the paddle to control my speed… slow down to stick the tail into the whitewater and paddle to speed up without having to backstep. Lots of aloha in the water and many fun waves all around. Should be good for the next couple of days I think. Have fun! I asked Todd Bradley from C4 Waterman to let me film him talking about the stand up paddle to share the fundamental information with everyone. I got a lot out of his explanations and hope it can help others. I know the idea is to stand on the stand up paddle surfboard the whole session but when the wind is over 20 mph it is super hard. Hence, today was a sit down paddle surf session. When it’s really windy and there are a lot of people around I don’t like to stand while waiting for waves. Part of it is because it’s hard to balance. The other part is that I don’t want the board to fly and hit someone if I fall off. I think a lot of the questions being asked about SUP are going to be answered in the C4 Stand Up Paddle Surfing DVD which is being released in October 2007. 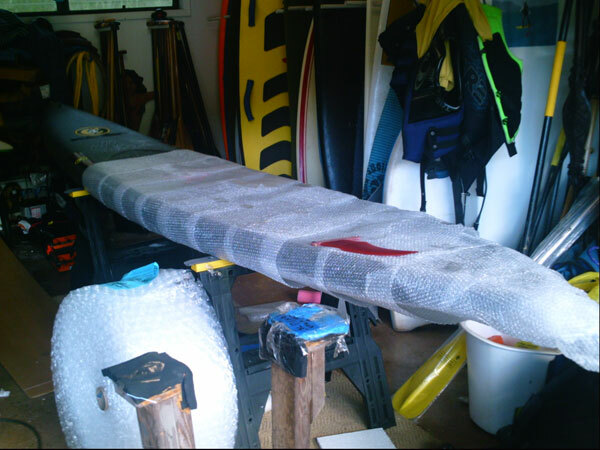 I’ve been riding the C4 Waterman 10′6″ stand up paddle surfboard for about 2 or 3 weeks now. I think I have about 15 hours on the 10′6″ for now and 6 hours on the 10′ stand up board. At 210 lbs on a good day, the 10′ board is a bit more challenging to balance on than the 10′6″ which I’m very comfortable on. The 10′ board surfs way better than anything I’ve tried so far so it’s been worth the extra effort to get the balance right. I paddled the 10′ today in 20+mph winds. Basically, paddling any size stand up paddle board is hard in winds over 15 mph. I was very pleased today in that I was able to balance on the 10′ C4 board and was fairly comfortable. I think with another 5 hours or so more of time on the 10′ board in the water I’ll be really comfortable and will have a much easier time surfing. We’ll see. 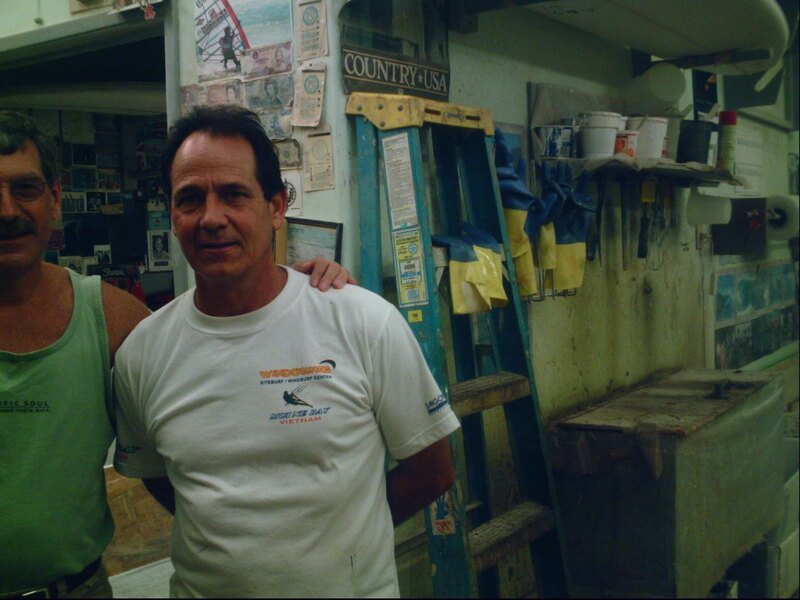 I asked Todd Bradley over at C4 Waterman for some pictures from when Dave Parmenter, Brian Keaulana and Todd were building the first stand up paddle surf boards. I just got the sneak peek at what’s to come over at C4 Waterman HQ. Todd showed me some new products that blew my mind. One of them was a full carbon fiber distance racing SUP that I think was 14 ft long. The whole shape and design looked like it was one of those spy planes the U.S. Air Force has. He let me take a picture of it but it’s still in my camera. I also got a quick 5 to 10 sec video of Todd in front of a huge room full of boards, paddles, dirt bikes, tow in surf gear, etc. It’s like a candy store for guys. He said I can post it for everyone to see. Here are some pictures from a Kiteboarding trip I went on in May 2007 to Maui. 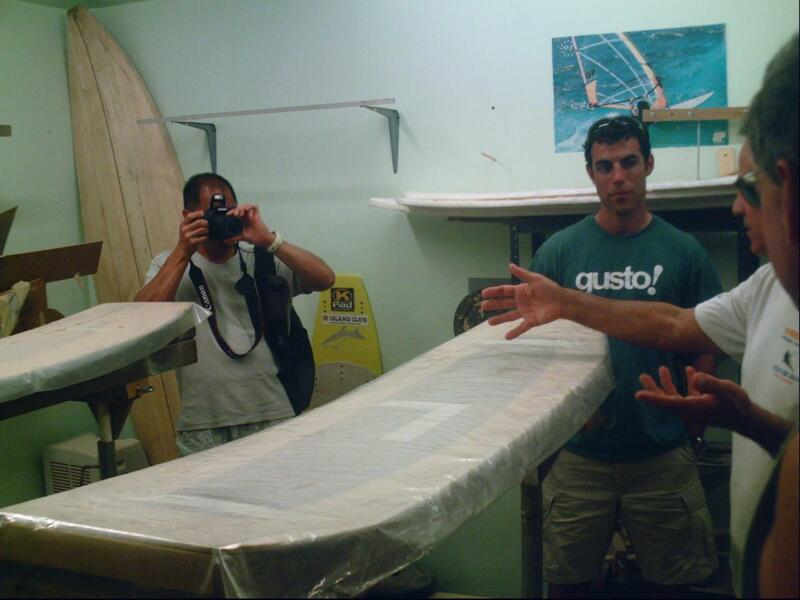 The first pictures are of Jimmy Lewis at his shaping shack in Haiku Maui. He’s shaping kiteboards in these pictures but we all know his stand up paddle surf boards are great too. Shawn Alladio joins Tom Jones as he passes Pillar Point, home of the big wave spot ‘Mavericks’. On Saturday we had launched from Pillar Point out to the legendary Mavericks surf spot. This was Tom’s ‘California Paddle’ launch point for the Central California leg of his environmental awareness paddle. HONOLULU – (August 22, 2007) – Half a century ago, Hawaiian Duke Kahanamoku, his many brothers, and a collective group of surfers who became known as the Waikiki Beachboys, gave rise to a sport that has today become a multi-billion dollar international industry. Prestige and money aside, what they really created was a tradition, handed down over the years, that has evolved into a complete waterman’s lifestyle. Today, there isn’t a soul who sets foot on Waikiki Beach who doesn’t snap a shot of the famous waters or venture further to try their own hand at the “sport of kings”. That tradition was celebrated today at Duke’s OceanFest, featuring the C4 Waterman/Honolua Surf Co. Stand-up Paddle Surfing Invitational. Looking to catch the next big wave in water sports? Try stand-up paddle surfing. With a big barge of a board and an extra-long paddle, you can get a full-body workout, cover lots of area and put an end to bad-wave days. Bobby Achoy’s hand feels like a rusty steel mitt as I grip it in the classic Hawaiian handshake. The famous Waikiki beachboy has put more miles on his hands than any waterman I have ever met, whether wrapped around a canoe paddle or from greeting the countless tourists he has squired around the gentle rollers of Waikiki Beach. I have asked him if we could talk about the origins of ‘beachboy style’ or ’stand-up’ surfing and, nodding in agreement, we sit down on the lava rock wall in front of the Duke Kahanamoku statue for my history lesson. On a recent boat trip to a secluded corner of the Maldives world renowned watermen Brian Keaulana and Todd Bradley teamed up with Tropicsurf ’s Ross Phillips to experiment with the latest developments in ocean technology. Their goal was to brainstorm future plans for a series of waterman courses in Australia in 2008. The Waterman Experience Weeks will be the very first of their kind open to the public and will commence early next year in Noosa, with the Maldives and Hawaii on the itinerary for late 2008. Designed for the regular surfer, the courses will focus on developing waterman skills and increasing overall ocean confidence so participants will not just be able to ride a wave, but really understand it. The program will be action packed with stand up paddle, tow-in, jet ski rescue, hydrofoil, underwater relaxation techniques, ocean swimming in challenging conditions and more.